(1) Change the title. Once called The Snow Queen, the movie is now called Frozen. Using the same tactic as when Disney switched the title of Rapunzel to Tangled to hide the female star, it’s become extremely rare for a female to be referenced in the title of an animated movie for children. (2) Change the story. In the original story, the girl rescues her brother. Now, she rescues her sister, keeping the trope of a damsel in distress and preventing a girl from saving a boy. (3) Create a male co-star. 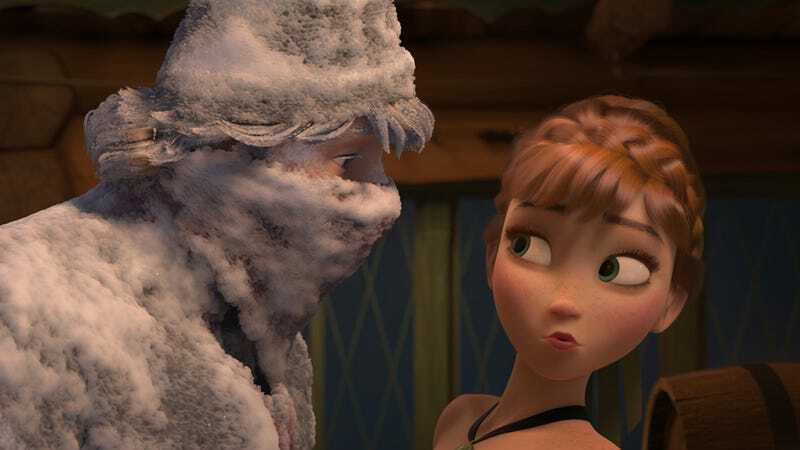 Just as Flynn Ryder’s role was expanded to equal Rapunzel’s in Tangled, Disney invented Kristoff, a mountain man, to share the screen with the heroine. (4) Don’t let females dominate posters or previews The first look trailer for Frozen has no Snow Queen and no females at all. It's a funny bit between two male characters. Margot Magowan's blog Reel Girl is dedicated to imagining gender equality in the fantasy world.